You’ve got options, and we know you like to be savvy with your money. As a bonus for your smart choice of opening a flex checking account, when you refer a friend, and they open their flex checking account with us, we’ll add $10 to both of your accounts. It’s that simple. If you haven’t opened your own flex checking account with us, no problem. Just stop by a branch today and we can have that done for you in minutes. Then feel free to make as many referrals as you like! Get started now. *Smart Bonus is valid for a limited time and available to Members 1st accounts in good standing. Members cannot refer their own accounts. Bonus will be applied to accounts electronically within 5–7 business days of account opening. Bonus offer can be terminated at any time by Members 1st without prior notice. Early account closure fees are applicable. Each member household saves an average $150 a year with a Members 1st Credit Union flex checking account as opposed to the average bank account. By choosing flex checking with Members 1st, you’ll rack up savings due to reduced loan rates, higher saving rates, and fewer and cheaper fees compared to most banks. View the results of our independent study. Don’t believe us? The proof is in the pudding. View the comparison below of some of the most common bank fees and checking account features compared to Members 1st. Comparison based on information obtained on issuers' websites or from customer service representatives as of July 2016. Comparison based on information obtained on issuers' websites or from customer service representatives as of February 2015. Enter your current financial institution's fees to see how much you would save compared to Members 1st. Monthly account feeMonthly service fee for your bank account, occasionally waived if you meet certain criteria. Monthly Bill Pay feeMonthly fee charged from your bank for making payments to people or businesses. Foreign ATM feeFee charged by banks for using ATMs that do not belong to the bank. Insufficient funds feeFee charged when a checking account is drawn negative. Stop payment feeFee charged for requesting the stop of a check payment in progress. Courtesy pay feeFee charged when you make a check or ACH payment and your account doesn’t have enough funds to complete the payment. The financial institution makes the payment on your behalf for a fee. Calculations based on average of two foreign ATM fees, two insufficient fund fee, one stop payment fee, and one courtesy pay fee per 12-month period. The figures entered on the input page of this calculator are for hypothetical purposes only. You should enter figures that are appropriate to your individual situation. The results provided by this calculator are also intended for illustrative purposes only and accuracy is not guaranteed. Members 1st Credit Union and its affiliates are not tax or legal advisors. This calculator is not intended to offer any tax , legal, financial, or investment advice and does not assure the availability of or your eligibility for any specific product offered by Members 1st Credit Union, its affiliates or any other institution, nor does this calculator predict or guarantee the actual results of any investment product. The terms and conditions of products offered by institutions will differ and may affect the results of the calculator. Please consult with qualified professionals to discuss your situation. The final APR may differ from the APR in the above results due to additional fees that may be applicable. 1The Credit Union National Association (CUNA) estimates that Members 1st Credit Union provided $1,475,979 in direct financial benefits to its 17,608 members during the twelve months ending September 2011. These benefits are equivalent to $84 per member or $159 per member household. Estimated total benefits of credit union membership are calculated by accounting for differences in credit union and bank pricing. Specifically, average credit union savings account yields, loan interest rates, and fees are compared to average bank savings account yields, loan interest rates and fees. The interest rate differences are then applied to respective average credit union loan and savings balances. Fee differences are weighted and applied to credit union non-interest income to obtain the total estimated benefits arising from fees. These benefits are averages. Mathematically, that means the total benefits provided are divided across all members (or all member households) - even those who conduct very little financial business with California credit unions. Ampre Debit Rewards are cash back offers tied directly to your Debit card from your favorite local and national brands—register your card. Your card is protected with Visa’s Zero Liability Policy and other benefits. Load digital coupons to your favorite restaurants and stores when you register Ampre debit rewards. Take your Debit Card anywhere knowing you have access to 30,000 surcharge free ATMs with the CO-OP ATM Network. Your Debit Card comes equipped with an EMV chip, the latest in technology and safety improvements. Using Apple Pay, Samsung Pay, and Google Pay in apps and the web happens in seconds with your mobile devices. Fast and easy access to your hard-earned money. Don't wait to deposit your paycheck or government benefits. Income received from your employer, Social Security, pension and retirement plans, the Armed Forces, VA benefits, and annuity or dividend payments may all qualify for Direct Deposit. 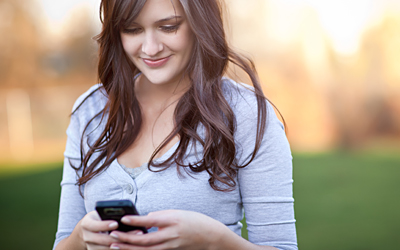 Sign up for eAlerts and receive an email or text notification each time your funds are deposited. ConvenientYour money is deposited automatically into your Members 1st account, ready for you to use immediately. FastDirect Deposits post the day we receive them from your employer rather than waiting for the 1st or 15th, meaning you may receive your paycheck 24-48 hours sooner than at other financial institutions. SecureNever worry about checks getting lost, delayed, or stolen. Simplify your life and pay all your bills from one convenient location. No more sorting through stacks of bills, keeping track of due dates, or remembering multiple usernames and passwords for biller websites. Decide who, when, and how much to pay with Members 1st Bill Pay. Deposit checks into your account anywhere, anytime. Your security is our utmost priority, which is why remote deposit transmissions are safeguarded by 128-bit SSL (Secure Socket Layer) encryption to prevent unauthorized access. The secure login information is never stored on your smartphone or tablet. For added protection, an automatic inactivity logout occurs if the app is inactive for ten minutes. Plus, account numbers are truncated and masked to only display the last four digits. Read the Remote Check Deposit Disclaimer. To ensure the safety of your personal and account information, download mobile apps from reputable sources only. 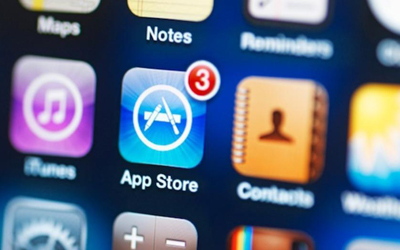 We encourage users to download the most recent version of our apps. 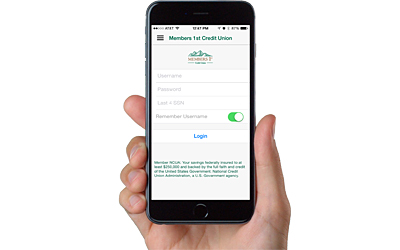 You can download the Members 1st Credit Union iPhone® App from the App Store and the Members 1st Credit Union Mobile App for Android™ from Google Play. The iPhone® is a registered trademark of Apple Inc. Android™ is a trademark of Google Inc. Message and data rates may apply from your wireless carrier. The iPhone® App requires iOS 3.1.3 or later. Download and activate the Members 1st App. Review all of the app features and capabilities. Deposit checks remotely with the Members 1st app. Complete access from Mobile Banking, Online Banking, Telephone Banking, and the Mobile App. Easily stay in touch with your finances. eStatementsEliminate the hassle and security risk of storing printed statements. Have access to your statements immediately, online at your fingertips. eAlertsSet up email or text alerts to notify you of low balances, large deposits, loan payments processed, large withdrawals, and much more. Discounts at the following businesses are included with your membership.